Home politics NASA FINALLY PICKS FLAG BEARER FACE UHURU. SURPRISE !!!!! The NASA committee, which held a meeting Monday, has developed a scheme that will see either the principals agreeing among themselves or constituting a select electoral college to name a flag bearer. Now reports from within the coalition indicate they have already agreed on the flag bearer and will be named anytime soon. 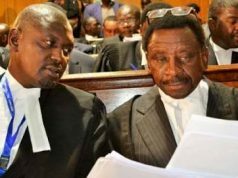 The committee, which met Monday, wants the principals – Kalonzo Musyoka (Wiper), Musalia Mudavadi (Amani National Congress), Raila Odinga (Orange Democratic Movement) and Moses Wetang’ula (Ford Kenya) to agree among themselves who should fly the NASA flag or, in the absence of this, the electoral college to be constituted to name the flag bearer.